The House of Horrors is an Eamon adventure written by Dan Cross. The premise of The House of Horrors references the 1985 purge of "junk" Eamon adventure from the NEUC archives. The May 1985 Eamon Adventurers Log announced the purge of House of Ill Repute, The Jungles of Vietnam, Operation Crab Key, and The Shopping Mall from the list of adventures, either due to "offensive" content or a lack of content. John Nelson preemptively defended the move from charges of censorship, writing that the NEUC was not barring authors from writing an offensive Eamon adventure, but merely "refusing to put it on our list and distribute it." The tone of the adventure is generally satirical yet humorous, although elements are critical of the NEUC and at times appear to be borderline antagonistic towards Nelson. 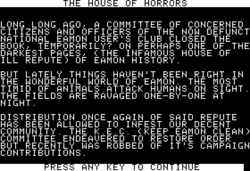 E.g., the portions of the disk that typically instruct players on how to contact the NEUC—text not appearing during normal play of the adventure—are replaced with instructions for contacting the "Keep Eamon Clean Committee C/O Mr. Cross" at a nonexistent Des Moines address. That Nelson is quoted as saying that Horrors "ha[d] some good stuff in it" in the October 1985 Eamon Adventurers Log suggests that it was written in good humor. Strangely, Cross attributes authorship as a joint effort between him and Nelson; whether this is accurate or intended as further satire is unclear. The adventure also incorporates elements of the NEUC "un-contest" also announced in the May 1985 Eamon Adventurer's Log, which spawned the adventures Orb of My Life, Life Orb of Mevtrelek, and Wrenhold's Secret Vigil. Horrors, e.g., incorporates the template for the introductory text and describes a homeless individual's spherical bottle of liquor as his "life orb." Although the three "official entries" were announced in October 1985, Horrors was not announced until October 1987 Eamon Adventurers Log making it unlikely that Horrors was in fact written as an entry but rather that Cross incorporated a further, satirical nod to the NEUC. The House of Horrors involves a return to the House of Ill Repute—note that "horrors" is a near-homonym with the term "whores". The premise is that the "Keep Eamon Clean Committee" (alternately, the "Keep Eamon PG Committee") has succeeded in shuttering the eponymous brothel, which has now fallen into disuse though kept under guard to prevent adventurers from entering. The adventure places the player in pursuit of the K.E.C. 's stolen funds, exploring the abandoned brothel accompanied by a guard. Tom Zuchowski rated Horrors favorably, awarding it a score of 6/10, praising Cross's use of embedded artifacts and clever puzzles. In terms of difficulty, Zuchowski rated it as 7/10, noting that the puzzles—however clever—were also "unforgiving." In comparison to House of Ill Repute, the inspiration for Horrors, Zuchowski wrote that the superior writing of the latter secured its place as the better of the two adventures. The review on the Interactive Fiction Database written by Wade Clarke is also favorable. Clarke, who wrote the survival-horror-themed adventure Leadlight, describes his stumbling upon the adventure as a "happy accident" when searching for other instances of horror-themed adventures. Although noting that the spelling and grammar was often lacking, Clarke described Horrors as a largely pleasant experience, suggesting that it was "written with gusto." Although noting that the humor was geared towards those already familiar with Eamon tropes—and hence not a good introductory adventure for a novice—Clarke did praise the humor. The map of Horrors is largely derived from that of House of Ill Repute, although the descriptions have been updated to reflect a lack of upkeep. Some characters from the earlier adventure are referenced, either through the appearance of their corpses or identifying artifacts. The Eamon Deluxe adventure A Runcible Cargo also sees a return of the House of Ill Repute, although in a new location. A note found in the Burly Irishman's desk suggests that, in addition to the Irishman's being a favored client, that the "Keep Eamon Clean Committee" has only succeeded in driving Eamon's brothels underground. This page was last edited on 14 September 2018, at 05:15.